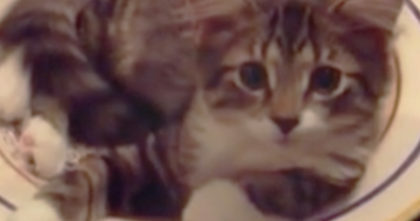 Fearless Cat Stands Up To Barking Dog, But When You See The Reason Why… SOO Funny, Omg!! Oh my goodness, I’ve gotta say this made me laugh quite a bit! — This cat through it would be a good idea to steal someones bed, but when it’s owner comes back to reclaim the bed, It’s NOT going to be easy! 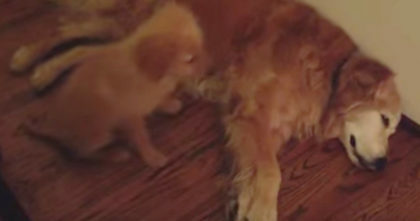 This cat is SOO fearless that there’s NO backing down, even if this dog thinks he can bark the cat away… This cat isn’t giving his bed back without quite the fight! 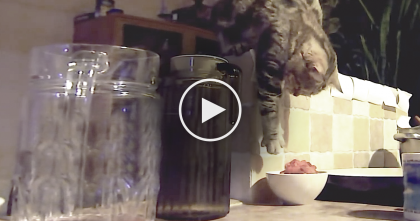 This is just hilarious, cat’s DON’T give up easy!—SHARE this story with your friends! 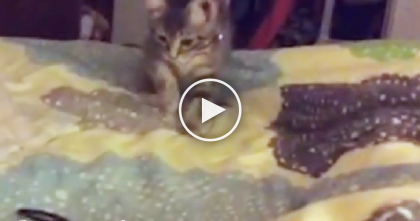 She Can’t Wait Till Morning, But That Won’t Stop Her From Doing This… OMG. These Kittens Try To Grow Up, But When You See What They Do… It’s A Cat-tastrophy, LOL! !